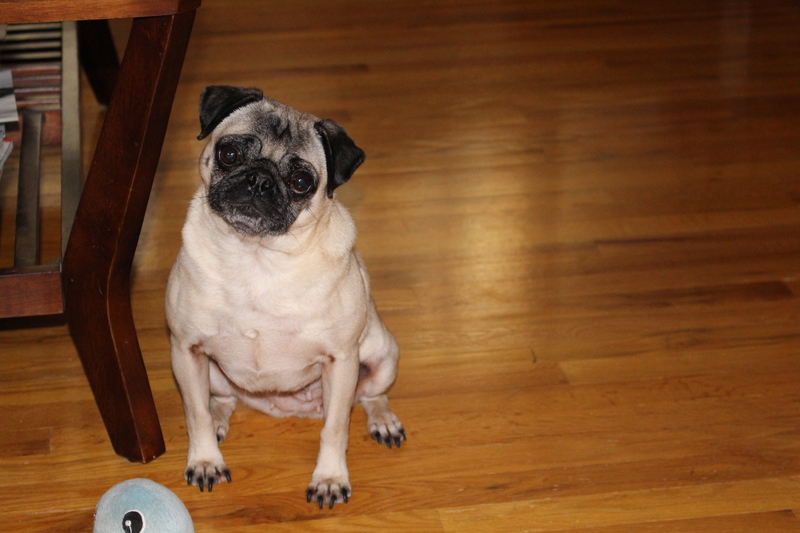 Most people talk to their dogs, but when we talk to our pug, it seems like she’s really listening intently. She’ll often chime in with heavy sighs and sounds of agreement or surprise when appropriate. Maybe it’s the head tilts that really seal the deal and convince us that she must have some idea what we are talking about! We love pugs, and we know that they are experts at getting into trouble when they have the proper motivation. 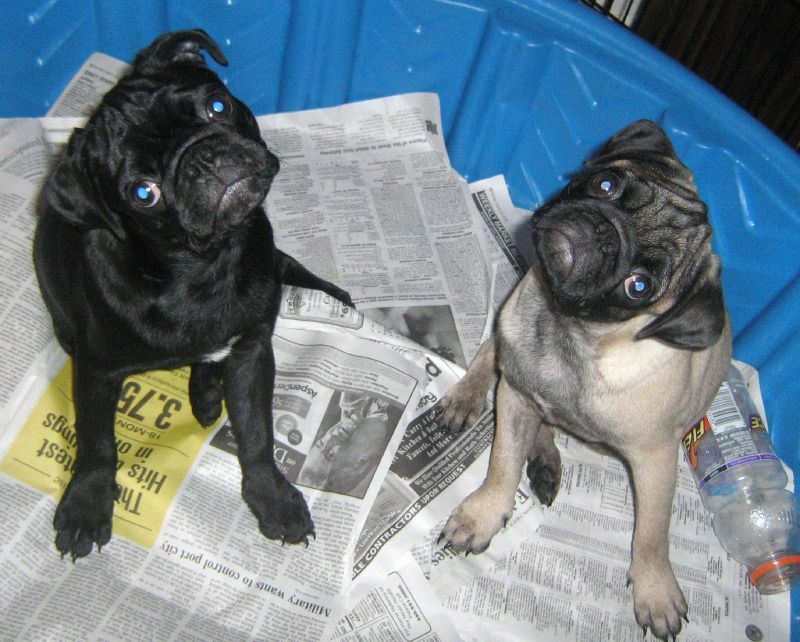 What pug could resist diving into the recycling and playing in all the old newspapers (and nibbling on the tastiest pages)? Our pug definitely has a weakness for chewing up paper, so we have to be extra careful to help her stay out of trouble! Even though it it is still freezing out, and there’s no end in sight to the wintery weather, Nickie is still leaving little puffs of fur everywhere she goes in the house. I tried to explain to her that this is why I had to vacuum this morning, even though I know she doesn’t like the vacuum. This was her response. The puppy dog eyes plus head tilt combo were almost enough for me to put the vacuum away. 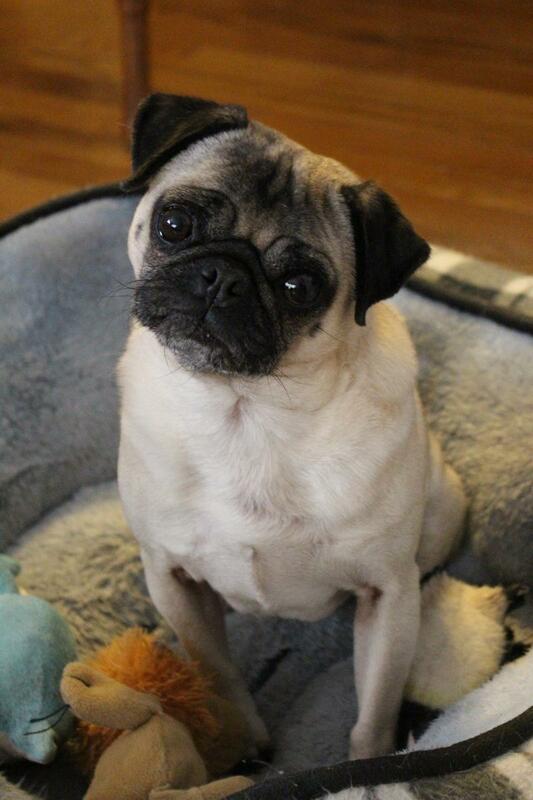 In addition to being super soft and adorable, pug ears are a defining feature of the breed. They can come in two different varieties. 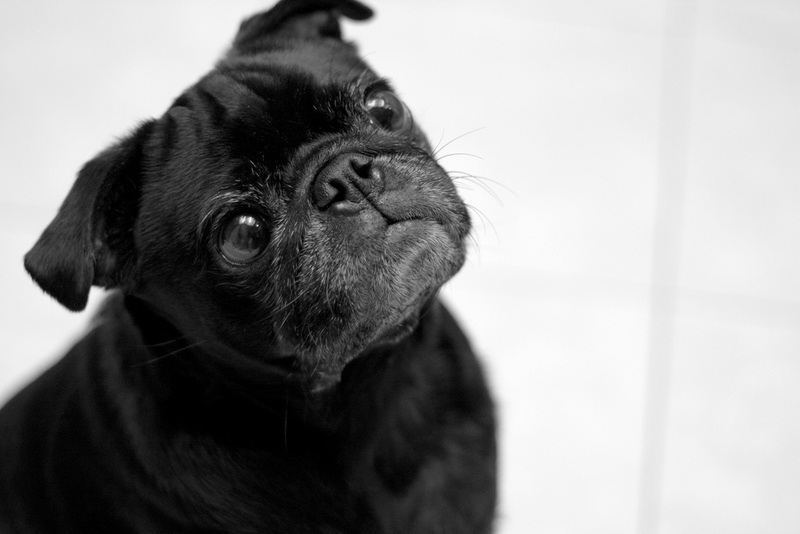 Most pugs have button ears with a fold going across the center and the tip coming down to the corner of the pug’s eye. It is rare to see a pug with rose ears. 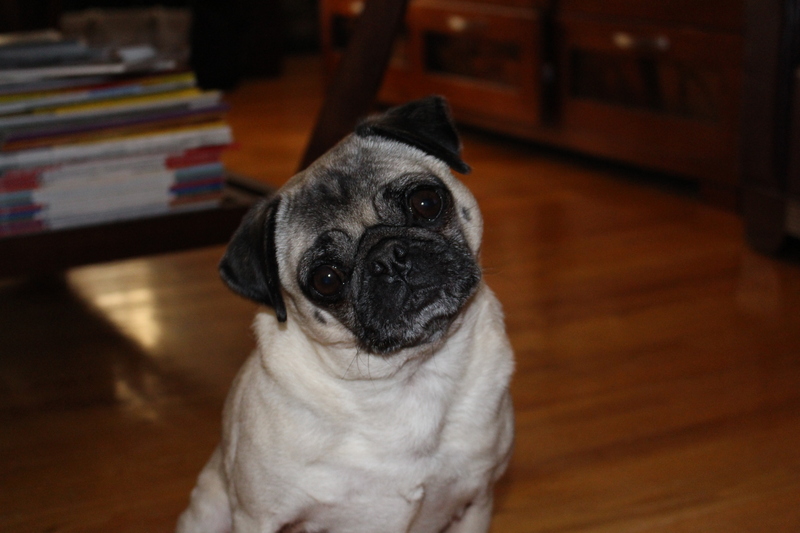 They are smaller and the front edge is folded against the side of the pug’s head. Here is Nickie showing off those button ears. We tried to explain to Nickie how it would be a great idea if she could just go ahead and go to work in our place today. We told her about the car ride there and all about the awesome cafeteria. We totally had her attention (and an intrigued head tilt) at cafeteria, but I don’t think she was on board with the whole “working” part. Maybe we’ll try again another day. One of the things we love about having a pug is that we always have a good listener available (except when she is sleeping…). 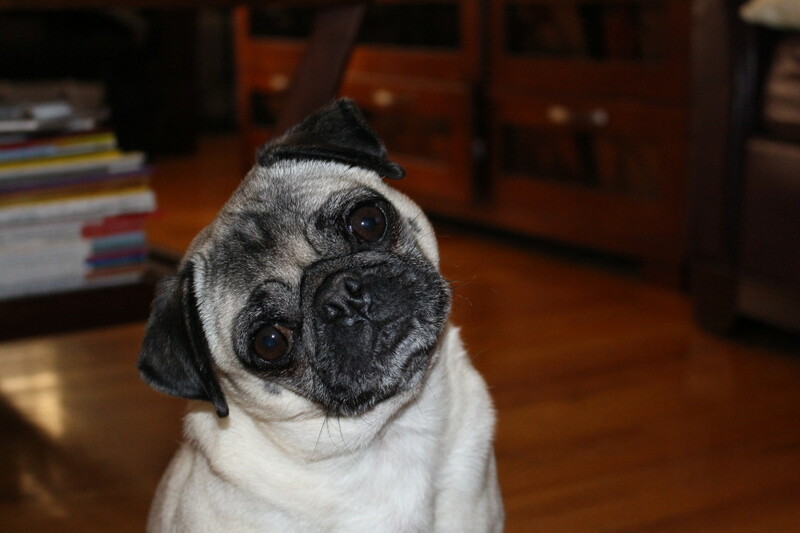 Most times when we tell her a lame story, she just sits quietly and occasionally gives us the characteristic pug head tilt.